Advocates held a press conference Monday questioning the timing of the city's homeless housing program and its lack of details. 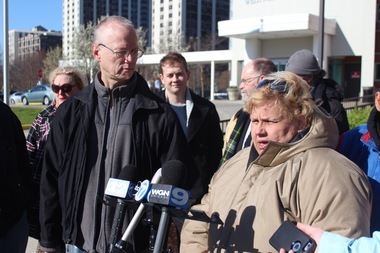 UPTOWN — Organizers of Uptown's Tent City lobbed criticism at the City's Task Force to Reduce Homelessness pilot program Monday morning, calling the initiative — which aims to find permanent housing for 75 residents residing under the viaducts at Lake Shore Drive — "a sick joke" at a press conference outside of Weiss Hospital. Calling it a "smoke and mirror" trick from City Hall's spin machine, activist Andy Thayer said the program's 75 available housing slots will barely make a dent in the homeless population of Chicago, which includes more than 125,000 people, according to the Chicago Coalition for the Homeless. "When you look at the scope of this plan it's frankly a joke," Thayer said. "You host a pilot program when you don’t know what to do about housing. And the fact is, there have been pilot programs all over the country for many many years now — some of them dubbed "housing-first" — that have been proven to actually do something to not only reduce homelessness, but a lot of the unintended ills that come with homelessness." "We don’t need a pilot program, and in this context, a pilot program is a token program," Thayer said. "A token program to clean up the viaducts just in time for the spring and summer festivals, which is really what’s going on here." Last summer, the homeless were kicked out from the viaducts in anticipation of a Mumford and Sons Concert at Montrose Beach sparking protests from residents, while the city claimed the removal of homeless people and their belongings from the area was part of a larger effort to secure the area for the concert. The homeless in the encampments and residents who live nearby should be concerned by the lack of details about the program and the timing, Thayer said. "You have to ask why there’s no details about this plan. There’s no information about where people would be housed, how they would be housed, when they wil be housed and, more importantly, why is this announcement being made right now," he said. "We spent a long cold winter of people sleeping underneath the viaducts and the city’s response was only legal harassment and not doing anything about housing for these folks." In April, Mayor Rahm Emanuel announced the task force had identified 75 people for the pilot program, but gave few details about the program except that it would work with nonprofit agencies and homeless advocates to target the "chronically homeless" — those found to be homeless for the last year, or four times over the last three years. After the protest Monday, the task force held a meeting with Ald. Harry Osterman (48th), Ald. James Cappleman (46th), tent encampment residents, representatives of various social service agencies along with advocates for the homeless inside Weiss Hospital, 4646 N. Marine Drive. "What we’re doing to address homelessness is a new step forward," Cappleman said at the beginning of the meeting. "It’s really focused on making it clear that we are hearing the needs of those people living out in the streets and we’re responding in a way that is actually focused on the use of best practices. And that is the housing-first model with wrap-around services." On April 6, the Department of Family and Support Services went to the viaducts to conduct "assessments" of 63 residents of Tent City. The assessments will help identify the outreach team best suited to help the individual and identify risk factors such as living with HIV, age and chronic medical conditions, officials said. While the team is still looking to identify candidates who may have not been under the viaducts at the time, they've already identified nine candidates who qualify for "rapid re-housing," which is available through the Chicago Department of Housing. Lisa Morrison Butler, who was named chairwoman of the task force when it was announced last month, said the program grew from lessons learned during the city's initiative to house homeless veterans. While they weren't able to house all the homeless veterans, as Emanuel promised, they were "successful in getting almost three times as many veterans housed as we originally thought we could," she said. But the funding that helped made that initiative successful is missing from this program, she said. "One of the things that made the veterans initiative so successful is we were able to use the federal funding if you will as almost the bully pulpit to bring all the players to the table. There is no federal funding this time to support this initiative. And that’s one of the reasons we’re starting off with a pilot," Butler said. “We recognize there is more homeless in the city than this pilot will touch, we recognize there are other encampments in the city this pilot won’t touch. This is just a pilot,“ she said. To fund the project, the Department of Family and Support services is "literally cobbling together ... funds from inside our house" and is attempting to lure "private sector" funding, Butler said, adding "we're having to be creative." While Butler was tight-lipped on potential investors, Osterman said Weiss Hospital is a partner and "is putting some money into this project." On the other hand, Cappleman has his own plans for funding the project long term such as raising the tax the city has already levied against AirBNB and other home-sharing services from 2 to 4 percent. Those funds would be routed to target the chronically homeless, he said. "The issue that I have seen is that we've never had a specified stream of money geared toward that population and that's something other cities have done and I'm working with the mayors office and [the Department of Family and Support Services] to make that happen," Cappleman said. The task force has set July as the deadline to complete the goals of the pilot program.